Designed as a companion modulator for the 90801 transmitter. This unit uses a pair of common 6146's to produce 40 watts of AM modulation. 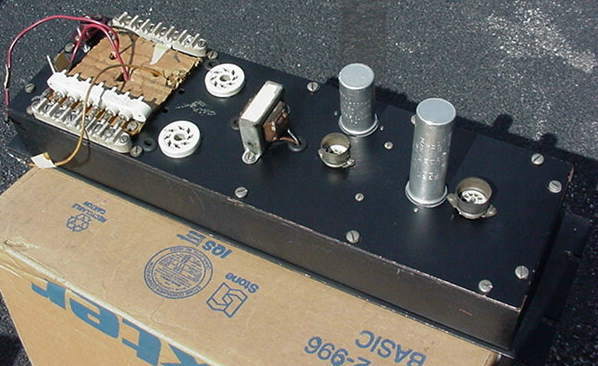 Some early versions of this modulator used 807 tubes in place of the 6146's. The audio amplification and driver stages consist of the 6C4 and 12AX7 vacuum tubes. The 90831 is a rather rare item in the Millen arsonal. However, it has been found in several variations as shown in the pictures above. The variation three pictures are those of a later model which belongs to Tom Smith N5AMA. The variation two picture is a early model belonging to Gary Carter WA4IAM. Notice that the early version uses a meter layout like that in the 90801 transmitter pictured elsewhere on this website. The later version uses a standard type meter with its own external case bezel. You can tell that both are original by the difference in labeling Millen used. Gary's early model does use 6146 modulators however. We thought we had all the answers and then variation one was discovered at the AWA flea market during the 2001 conference. At first it was thought to be a very early prototype or production run. However, it was later discovered in the 1959-1960 Millen catalog. Thus, the large front panel version, 5.25" vs 3.5" used in variation one and two, appeared to be the last of the 90831 modulators or at least a later variation made for a special reason. You can see from the rear view that it is socketed for the same 6146 tubes. From catalog pictures of the rear chassis it originally contained a much larger cylinder shaped modulation transformer and had a battery mounting bracket on the side of the transformer to house a 45 VDC dry cell for modulator tube biasing. Both these items were missing on the fleamarket find! But wait! An interesting twist occurs when you look closely at the picture of the modulator in the 59-60 catalog. You see that it has the 807 modulator tubes, but the associated text indicates that 6146's are used. My guess is that variation one is indeed a first run model of the 90831 modulator since it is the only one that I've ever seen 807 modulators tubes in, albeit just a picture. My quess is that by 1959 they were not selling many of these modulators anymore and whomever pulled the picture to include in the catalog grabbed an old version of the unit. Another hint that it is an early series modulator is that neither the catalog pictured unit or this one seen at the flea market have serial number ID plates. So which was really first? The basic design is from the later 40's using 807's, and the Millen schematic for the 6146 version is dated the end of 1953. The 3.5" panel 90801 transmitter with the variation two look was produced starting mid-year 1953. Anyone with additional information on the variations please share with us what you know.